Garcinia cambogia is a plant that is native to Southeast Asia. It's also grown and readily used for cooking in India and other parts of Asia and Africa. The most useful part of Garcinia is the yellow-coloured, pumpkin-shaped fruit, which is also called assam fruit. digestive aid. Garcinia fruit also has anti-bacterial properties and is used to cure and preserve fish in India and Southeast Asia. More recently, in Asia, this ingredient has been used as a food additive because it makes meals feel more filling, which prevents over-eating and supports weight loss. supplement, it's best to combine the use of Garcinia with a healthy diet and consistent exercise routine. There's a phytochemical found in Garcinia, called hydroxycitric acid (HCA), and it has a dual effect on supporting weight loss. (1) HCA has the ability to reduce appetite by way of increasing serotonin levels in the brain. Serotonin is a neurotransmitter that affects mood and sleep patterns. Increasing serotonin levels has been shown to decrease food intake, enhance mood, and reduce weight gain. (2) HCA can support weight loss by inhibiting an enzyme called ATP-citrate-lyase (ACL). This enzyme helps convert excess carbohydrates (sugars) into fat in the body. When HCA inhibits ATP-citrate-lyase, fat build-up and storage is blocked in the body. To get the best results from Garcinia, you need to make sure that you're using an extract standardized for a high percentage of HCA. Research shows that you need an extract that delivers at least 50% HCA, or you simply won't get the results you're after. SD Pharmaceuticals' GARCINIA CAMBOGIA 500™ delivers a 60% HCA extract, which is the highest percentage commercially available today! In addition, GARCINIA CAMBOGIA 500™ uses the clinically-proven absorption enhancer, AstraGin™, to further improve its absorption and effects! 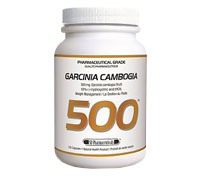 The best time to take SD Pharmaceuticals Garcinia Cambogia 500 is 15 to 30 minutes before meals. The recommended dose is 500 to 1000 mg (1-2 capsules), up to 3 times daily. Most people find that Garcinia is most effective when taken before the 3 main meals of the day (breakfast, lunch and dinner). Serving Size: 1 Veggie-Capsule Servings per Container: 135 Amount Per Serving % Daily Value * South Asian Garcinia Cambogia 500 500 mg Garcinia Cambogia Extract (Fruit) 60% (-)-hydroxycitric acid (HCA) AstraGin™ (Absorption Enhancer) 2.5 mg (Panax notoginseng – Astragulus membranaceous) 2.5 mg * Percent daily values are based on a 2000 calorie diet † Daily Value not established Note: Serving Sizes are rounded to the nearest whole serving Additional Ingredients:Vegetable Cellulose (capsule), Magnesium Stearate, (vegetable source) Allergy Information: n/a Warning: Keep out of reach of children. Do not use if pregnant or nursing. Not intended for use by persons under the age of 18. Consult a health care practitioner before using this product if you have been treated for or diagnosed with any medical condition, or if you are using any over-the-counter or prescription medication. Store in a cool, dry place.